The Ideal Simulator For Advanced IV Training! The dorsal surface of this incredibly realistic hand includes injectable metacarpal, digital and thumb veins. 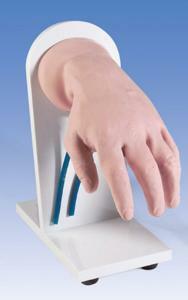 The soft, flexible fingers are molded separately with extreme attention to detail. Students have the opportunity to develop important manipulation skills provided by the flexion of the wrist. The skin rolls when the veins are palpated. This injection simulator is a great teaching and learning tool.